Bleach cleanable carpets are made of 100% polypropylene fibres which repel spills & stains, making them exceptionally easy to clean! When anything spills onto the polypropylene the dirt just sits on top of the fibre instead of penetrating into it, making this type of carpet perfect for busy family homes! Before preparing any bleach solution, ensure that your hands are covered with rubber gloves, and put on a mask to protect your respiratory system from the toxic smell produced by the bleach. 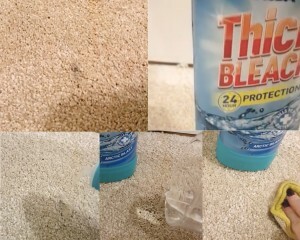 Bleach does not remove mold from the carpet. If your carpet has mold, use mold cleaning agents to remove the spores that are stuck on the fibre of the carpet. You can use a knife to loosen caked substances sticking on the carpet. Use a vacuum cleaner to clean dirt and debris that are stuck on your carpet. Prepare your bleach solution in your container by mixing water and bleach, then pour the mixture into a clean spray container. Before applying, ensure that your room is well ventilated. Spray the mixture onto the stain, give it a gentle rub and pat dry with a dry cloth or paper towel. Before preparing any bleach solution, ensure that your hands are covered with rubber gloves, and put on a mask to protect your respiratory system from the toxic smell produced by the bleach and keep the room well ventilated. So say goodbye to stains and take a look at the range of bleach cleanable carpets – For more information on our bleach cleanable carpets please call us direct on 01604 702774. Important: The only carpet that is safe to use a bleach mix on is a 100% polypropylene carpet. Always check with your carpet supplier if you’re not sure what your carpet is made of. Bleach will lift colour from wool and any other carpet, so it’s really important to make sure your carpet is definitely made of polypropylene.